Samosas are the most popular Indian tea time snack and vegetarian appetizer street food not only in India but all over the world. 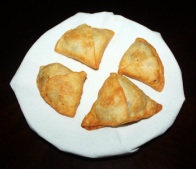 Samosa is often served with mint or coriander chutney and tamarind chutney as hors d’oeuvres. 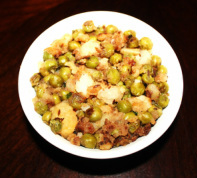 Traditional north Indian Samosa generally consists of a triangular shaped pastry shell with a potato and green peas stuffing. 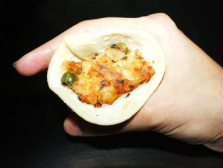 As samosas are becoming popular, various kind of stuffing have been experimented such as meat, fish, spinach and paneer and each of them are delicious. A popular non – vegetarian variant of this classic dish is samosa stuff with spicy ground lamb meat. 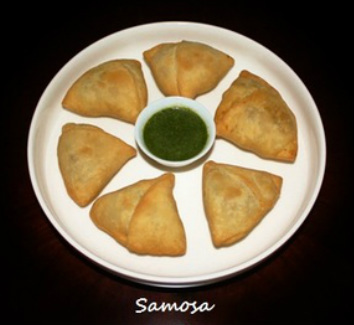 Restaurants typically serve samosas hot with various types of chutney. 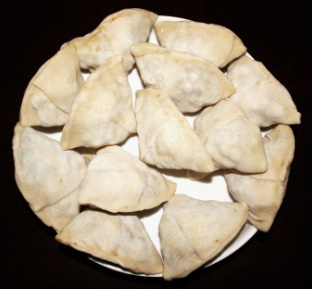 Frozen samosas with an assortment of fillings ranging from minced meat with herbs and spices to vegetables such as cauliflower and potatoes, are increasingly available in grocery stores. 1. In a bowl place all- purpose flour (maida.). Add oil, salt and mix. doing this all the flour grain coats with the oil. 3. 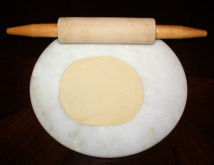 Add a little water at a time and mix it with flour and oil mixture in a rotating motion from the center of the bowl to outward until it form a dough and it cleans the sides of the bowl, knead it for 2 minutes and leave it covered with a wet cloth for 15 minutes. 4. If making dough in the food processer or dough maker add all-purpose flour, salt and oil. Run the food processer or the dough maker and mix till the flour turn into fine crumbs. 5. Add little water at a time and mix to make firm and smooth dough. 6. Remove the dough from the food processer and place it in a bowl and cover with a wet towel, keep it aside for at least 15 minutes. mash them in to small pieces. 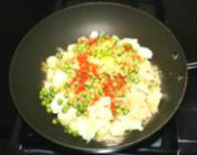 for 8 to 10 minutes or until the peas become tender. Keep them aside. and sauté, do not brown the garlic. 5. Add grated ginger and chopped green chilies and fry on medium heat. 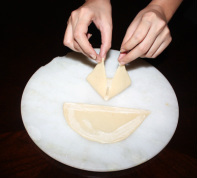 make a paste for sealing the samosas. Keep it aside. 4. 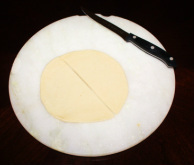 With a knife cut the circle into half and form two semi circles. 5. 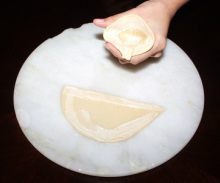 Dip your finger in the flour paste and apply on the edges of the semi circles. 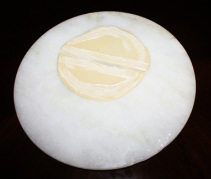 and seal, with other hand seal the edges by pressing with the fingers. cone open in it, like holding ice cream cone. if required, the seam should be about ¼” wide. 10. Repeat this process until all the samosas are made. 1. 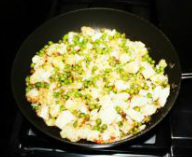 Heat 3 cups of vegetable oil in a frying pan or kadhi, on medium heat. 2. In about 6 to 7 minute oil will become hot. 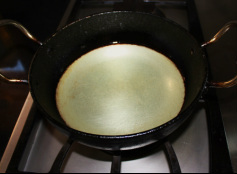 To check if the oil is ready, drop a small ball of dough in the hot oil, if the dough starts sizzling and come up slowly it means it is the right heat but if it becomes too dark quickly it means oil is too hot, turn the heat down. pierced spatula start flickering hot oil over the top of samosas, then flip them to other side and fry, keep flipping samosas around for 8 to 10 minutes or until they become golden brown on both sides. place them on a plate over paper towel so that all the excess oil absorbed. 5. Turn the heat down before slipping the other batch of samosa to fry because oil is hot and you do not want that samosa crust fry too quickly. 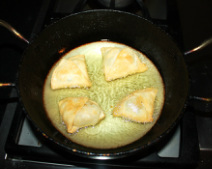 Once all the samosas you want to fry are in the hot oil flicker some oil over the samosa then turn the heat up to medium. Repeat the process until you fried all the samosas. 6. Serve samosa hot with coriander chutney, tamarind chutney or ketchup. 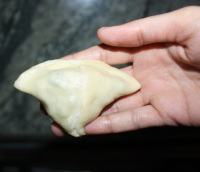 Samosa can be made in large quantity and stored in the freezer without frying them. 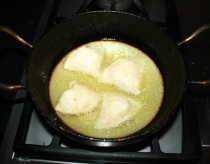 When ready to eat take out as many as you want and fry them on low heat without thawing. plastic food wrap or wax paper. 2. 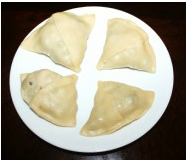 Make few samosas and place them on the plastic food wrap or wax paper in the freezer. Repeat until you make all the samosas. 3. 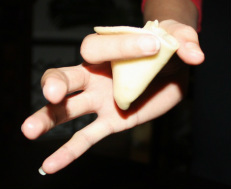 Once all the samosas freeze pick them up from the plastic food wrap or the wax paper and store them in the plastic bag or a container and place them in the freezer. 4. Whenever you want to eat, heat the oil and carefully drop in few samosas at a time and fry for 10 to 12 minutes on very low heat, with the spatula flicker some oil over the samosas and keep turning them around every 1 minute, so that they fry evenly and inside potatoes filling become hot.